The number of patients with dementia have been increasing exponentially with the aging of society. The development of AD research has clarified that the pathogenesis of AD is initiated by Aβ amyloidosis with secondary tauopathy and provided a strategy for investigating drugs that may improve or cure AD. Mild cognitive impairment (MCI) as a prodromal stage of AD and the pathogenesis of Dementia with Lewy bodies (DLB) and Frontotemporal lobar degeneration (FTLD) as a non-AD type dementia have also been elucidated. 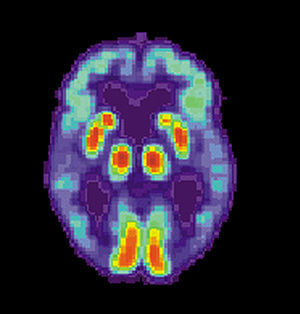 Currently, a consortium study by the Alzheimer Disease Neuroimaging initiative (ADNI) is being performed to establish global clinical evidence regarding a neuropsychiatric test battery, CSF biomarkers, neuroimaging including MRI, FDG-PET, and amyloid PET to predict progression from MCI to AD and to promote studies of basic therapy for AD . Several new biomarkers such as Aβ oligomer, α-synuclein, and TDP-43 are now under investigation for further determination of their usefulness to detect AD and other non-AD type dementia. 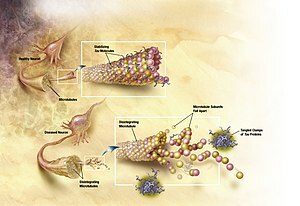 Cerebrospinal Fluid Aβ40, Aβ42, Tau, and Phosphorylated Tau biomarkers have been used for a clinical diagnosis of AD, discrimination from the Vascular dementia (VaD) and non-AD type dementia, exclusion of treatable dementia and MCI, prediction of AD onset and evaluation of the clinical trials of an anti-Aβ antibody, Aβ vaccine therapy, and secretase inhibitors [2–4]. In the current study Schoonenboom et al.,  conducted a large cohort of patients with different types of dementia to determine how amyloid β 42 (Aβ42), total tau (t-tau), and phosphorylated tau (p-tau) levels behave in CSF. 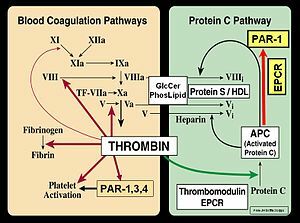 Aβ is produced mainly in the nerve cells of the brain, and it is secreted about 12 hours later into the CSF, then excreted through the blood-brain barrier 24 hours later into blood (Aβ clearance), and finally degraded in the reticuloendothelial system. Aβ levels are regulated in strict equilibrium among the brain, CSF, and blood [6, 7]. Aβ levels are high while awake and low while a sleep suggesting the presence of a daily change in the CSF Aβ amounts and it is because Aβ amounts in CSF are controlled by orexin and thus collection of CSF by lumbar puncture early in morning in a fasting state is recommended . In AD brains, Aβ42 forms insoluble amyloids and accumulates as insoluble amyloid fibrils in the brain. The reason Aβ42 levels are decreased in the CSF of AD patients is considered to be caused by deterioration of physiologic Aβ clearance into the CSF in AD brains [2, 3]. CSF total tau levels increase slightly with aging. However, CSF tau levels show a 3-fold greater increase in AD patients than in normal controls . It is thought that the rise in CSF total tau is related to degeneration of axons and neurons and to severe destructive disease of the nervous system. Several diseases show slightly increased tau levels such as VaD, multiple sclerosis, AIDS dementia, head injury, and tauopathy. However, CSF tau levels show significant increases in Creutzfeldt-Jakob disease (CJD) and meningoencephalitis . These biomarkers can be measured with an Amyloid ELISA Kit (Wako), which is commercially available and used worldwide. The ELISA kit was developed in Japan by Suzuki et al. and shows extremely high sensitivity and reproducibility . 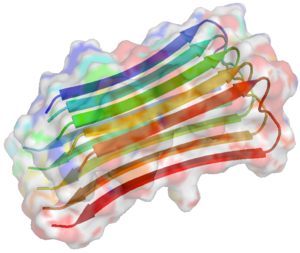 INNOTEST β-AMYLOID1-42 (Innogenetics), for Aβ42 is used widely in Europe and America. 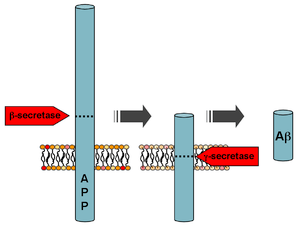 Several assay kits for total tau and phosphorylated tau are also used for the measurement of CSF tau. Currently, total tau is measured using INNOTEST hTau Ag (Innogenetics). There are 3 ELISA systems for measurement of phosphorylated tau that recognize the special phosphorylation sites at Ser199 (Mitsubishi Chemical Corp.), Thr181 (Innogenetics) and Thr231 (Applied NeuroSolutions Inc.), and phosphorylated tau levels are increased in CSF of AD on assays using these kits. Of these 3 kits, INNOTEST PHOSPHO-TAU (181) (Innogenetics) is commercially available and used widely. Recently, INNO-BIA AlzBio3 by Innogenetics has been able to measure Aβ1-42, total tau, and P-tau181P simultaneously in 75 μL of CSF, which is a very small amount of CSF. Autopsy was obtained in a subgroup of about 17 patients. The study suggested that CSF Aβ42, t-tau, and p-tau are useful in differential dementia diagnosis, whereas in DLB, FTLD, VaD, and CBD, a substantial group exhibited a CSF AD biomarker profile, which requires more autopsy confirmation in the future. The study found a correct classification of patients with AD (92%) and patients with OD (66%) when CSF Aβ42 and p-tau were combined. Patients with progressive supranuclear palsy had normal CSF biomarker values in 90%. 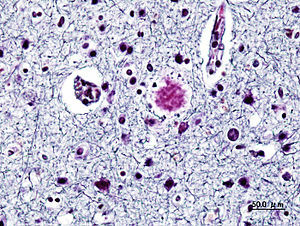 Patients with Creutzfeldt-Jakob disease demonstrated an extremely high CSF t-tau at a relatively normal CSF p-tau. 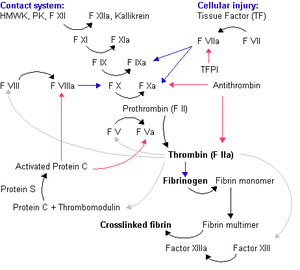 30% in frontotemporal lobar degeneration (FTLD) and vascular dementia (VaD). PSY and SMC patients had normal CSF biomarkers in 91% and 88%. Older patients are more likely to have a CSF AD profile. Concordance between clinical and neuropathologic diagnosis was 85%. CSF markers reflected neuropathology in 94%. The study concluded that CSF Aβ42, t-tau, and p-tau are useful in differential dementia diagnosis. However, in DLB, FTLD, VaD, and CBD, a substantial group exhibit a CSF AD biomarker profile, which requires more autopsy confirmation in the future. 1. R. C. Petersen, P. S. Aisen, L. A. Beckett et al., “Alzheimer’s Disease Neuroimaging Initiative (ADNI): clinical characterization,” Neurology, vol. 74, no. 3, pp. 201–209, 2010. 2. M. Shoji and M. Kanai, “Cerebrospinal fluid Aβ40 and Aβ42: natural course and clinical usefulness,” Journal of Alzheimer’s Disease, vol. 3, no. 3, pp. 313–321, 2001. 3. M. Shoji, M. Kanai, E. Matsubara et al., “The levels of cerebrospinal fluid Aβ40 and Aβ42(43) are regulated age-dependently,” Neurobiology of Aging, vol. 22, no. 2, pp. 209–215, 2001. 4. M. Kanai, E. Matsubara, K. Isoe et al., “Longitudinal study of cerebrospinal fluid levels of tau, Aβ1-40, and Aβ1-42(43) in Alzheimer’s disease: a study in Japan,” Annals of Neurology, vol. 44, no. 1, pp. 17–26, 1998. 5. J. E. Kang, M. M. Lim, R. J. Bateman et al., “Amyloid-β dynamics are regulated by orexin and the sleep-wake cycle,” Science, vol. 326, no. 5955, pp. 1005–1007, 2009. 6. M. Shoji, T. E. Golde, J. Ghiso et al., “Production of the Alzheimer amyloid β protein by normal proteolytic processing,” Science, vol. 258, no. 5079, pp. 126–129, 1992. 7. R. J. Bateman, E. R. Siemers, K. G. Mawuenyega et al., “A γ-secretase inhibitor decreases amyloid-β production in the central nervous system,” Annals of Neurology, vol. 66, no. 1, pp. 48–54, 2009. 8. M. Shoji, E. Matsubara, T. Murakami et al., “Cerebrospinal fluid tau in dementia disorders: a large scale multicenter study by a Japanese study group,” Neurobiology of Aging, vol. 23, no. 3, pp. 363–370, 2002. 9. N. Suzuki, T. T. Cheung, X. D. Cai et al., “An increased percentage of long amyloid β protein secreted by familial amyloid β protein precursor (βAPP) mutants,” Science, vol. 264, no. 5163, pp. 1336–1340, 1994. Special thanks to Wikipedia for excellent relevant pictures and keyword links. On the occasion of its 200th anniversary, one might ask why so many articles on neurologic and psychiatric diseases have been published in the Journal and what impact these pieces have had on their respective fields. Although the Journal is replete with reports of neurologic conditions that have entered the canon of medicine, it has been the large number and the breadth of clinical trials that have redefined neurology and psychiatry as active, therapeutic specialties. This article reviews the evolution of our understanding of neurologic and psychiatric conditions during the past two centuries. Denny-Brown emphasized recent contributions on the neurologic aspects of liver failure, the recognition that transient ischemic attacks were due to occlusion of the carotid artery, and the emerging understanding of increased intracranial pressure. There was little question at the time that neurologic and psychiatric diseases both acted on the same brain, but Denny-Brown’s position in his Shattuck Lecture marked the emergence of American neurology, pointedly disengaging it from the popular practice of neuropsychiatry and aligning it with internal medicine. He provided a modern manifesto for neurology, which nonetheless remained largely an elegant diagnostic specialty. The use of the label “neurasthenia,” and probably its reported incidence, expanded greatly after Beard’s article appeared. It was called the “American disease” by the illustrious French neurologist, J.-M. Charcot, who took it up for study as a strictly neurologic condition. By medicalizing the misfortunes of life, for which care is still so frequently sought, physicians became comfortable invoking a patient’s constitutional makeup, as if it were a physical entity, as the substrate for exhaustion, melancholia, depression, discouragement, weakness, and headache. These articles about psychiatry published in the Journal are influencing that field, as other articles have in neurology and neurosurgery, bringing the study of mental life and its diseases back into contemporary medicine and thereby rejoining the specialties of the brain. For 200 years, the Journal has seen neurology and psychiatry evolve from a European to an international scope, from an emphasis on diagnosis to an emphasis on treatment, and has published many of the fundamental descriptions of nervous and mental diseases while cultivating a new and potent therapeutic course. One would expect the next 100 years to bring a new outlook on diseases of the nervous system that is based on fundamental biology, but the need for keen observation of the individual patient is not likely to be supplanted.